A new year begs reflection and forward momentum. We are not fans of massive resolutions or regrets but we do think it’s important to pause and look back (then forward!). Here are some of our most memorable moments from 2018 and our hopes and dreams for the new year. We bought the building! BAM! 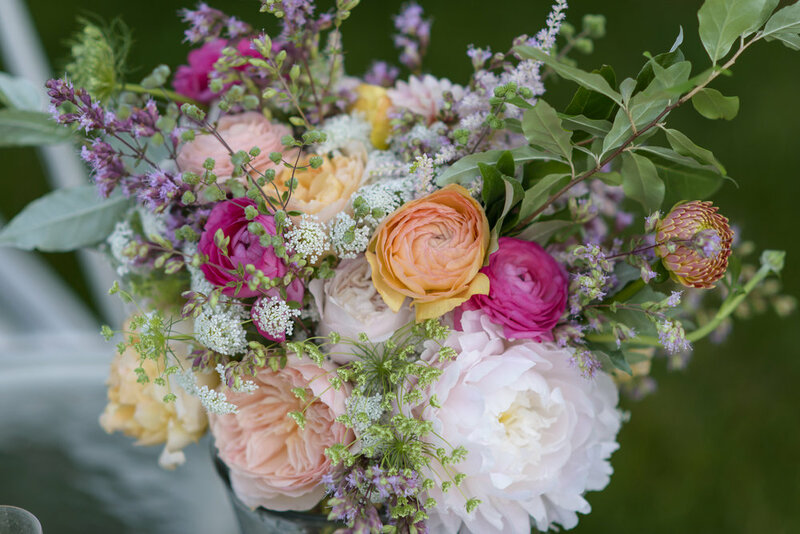 Partnering with brides who recognize and love our style and couples who trust us to create designers choice flowers. These relationships are such an honor and we do not take the responsibility they bring lightly. Working with the best team ever. Our tight-knit group of women support each other through thick and thin. Our new and improved driveway makes daily life so much easier for flower delivery, customers, and employees alike. Win, win, win. Saying goodbye to our beloved Elizabeth. Disagreeing with the town zoning laws. We can no longer host pop-up events that support local makers and artisans. The zoning laws are also making new signage a struggle. Lots and lots of rainy and windy wedding weekends! Blah! To host an array of exciting and inspiring workshops and host them at new locations (besides our dreamy greenhouse). Emily traveling to Amsterdam trip to meet her flower idol, Ariella Chezar! So here is to 2019! May it be a year of growth, determination, and flowers, flowers, flowers! Our philosophy when it comes to shopping for holiday gifts is always quality over quantity. We know there are quite a few people out there who would rather buy 3 pillows from HomeGoods that are only $20 each, rather than spend money on just one beautifully hand dyed pillow — and on the surface, why wouldn’t you? You get three pillows for the price of one, and at first glance, that seems great. But the truth is there are more than a few reasons why buying quantity over quality is going to disappoint you in the long run. Here are our favorite reasons why you should shop for quality, handmade items this holiday season. There are some things that aren’t necessarily worth applying the ‘Buy it For Life’ philosophy to, such as reading glasses or socks, but for most items from mugs, to throw pillows, candles, and more, buying quality will always pay off. Products made from high-quality materials stand up to everyday use much better than cheaper items made from weak materials and sloppy construction. Gifting a quality items means buying an item you love, an item that makes the receiver feel good every single time they use or see it. Wouldn’t you much rather have one or two lotions that are your favourite rather than trying to choose between a selection of lumpy, oily products that don’t make you feel great? When you buy quality, all of your items can be the favourite, and as a consequence of having less, you’ll take better care of them, as well. It can be easy to let an item fall into disrepair when you are able to say “Oh well, I have a few more mugs just like this one.” Having quality means taking care of quality— and in return, special items will last for decades. 3. You’re saving the planet! This one is simple. The more junk you buy, the more junk somebody eventually gets rid of. If you’re buying poor quality goods over and over, and each time something wears out or breaks you need to throw it away, you’re not doing yourself or the Earth a favor. On top of that, cheap products are often constructed using bad practices and harmful chemicals in the process - all of which destroy our planet. Here are a few categories of items we carry in the shop that are great places to start when shopping for quality over quantity. All the money you spend of these beautiful things help to support creative individuals and small businesses - not megastores. We carry three unique local pottery lines - Leslie Freeman (island made), Lainy Fink (island made), Meave McAuliffe (island made), and Farmhouse Pottery (from Vermont). The craftsmanship, feel, and colors created by these artists can not be matched. 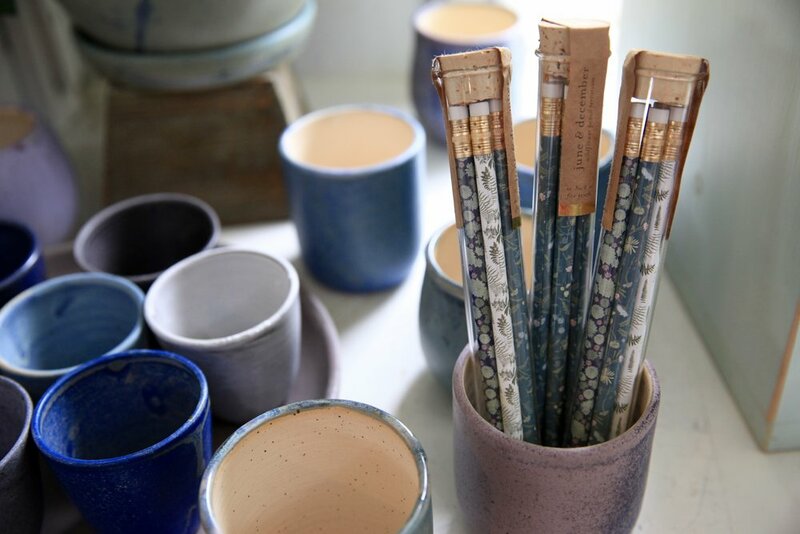 You don’t have to think of a pottery overhaul as an all or nothing process - investing in just one place-setting every few months will slowly grow your collection. We promise morning coffee tastes better out of a hand thrown mug! Sure, you can buy a throw pillow almost anywhere but not a handpainted watercolor pattern which is then screen printed on linen - that’s for sure! We love Martha Oakes’ simple and elegant pillows, delicious plant dyed velvet pillows from Edie Ure, and classic washed linen from Farmhouse. It is a fact that a stunning set of throw pillows can completely transform a room and when you look at it that way - they’re a bargain. Washing your hands all day during cold and flu season can feel like a chore but not with locally made soap from Flat Point Farm. And to nourish that dry skin? Try Rose Hibiscus Coconut Water Hydrating Face Mist from Herbivore Botanicals. 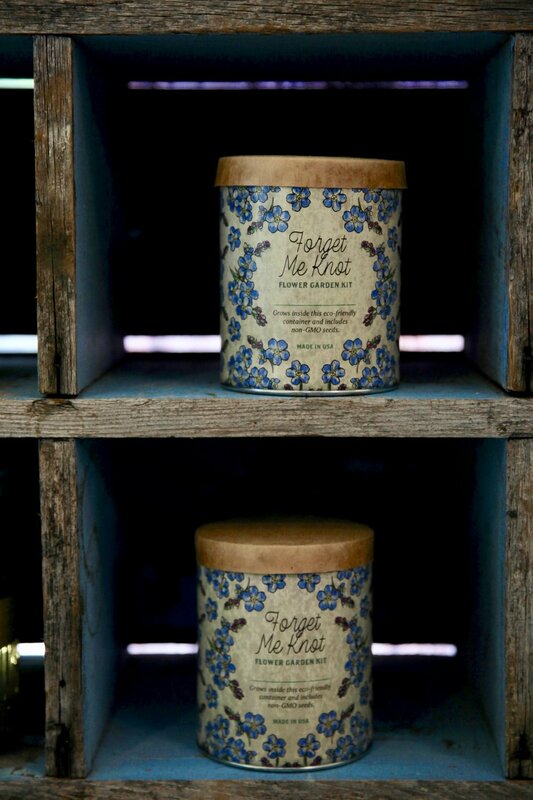 Both of these companies blend stunning natural scents with ingredients that are both cleansing and nourishing for your skin. You’ll look forward to washing up with these beauties at your sink. Teachers, neighbors, and secret Santas will all be thrilled with something from Flat Point or Herbivore - they are real crowd pleasers. Living, colorful, green things really are the gifts that keep on giving. 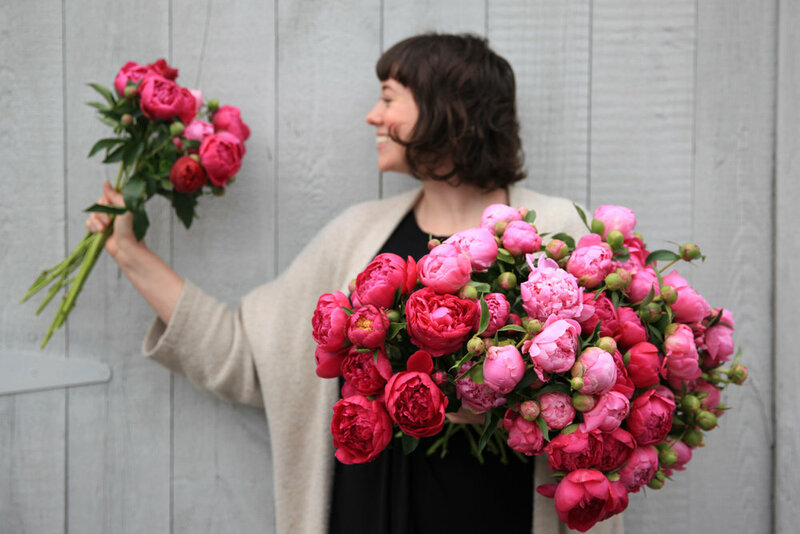 We think the ultimate holiday gift is a yearly flower subscription with Morrice Florist. We’ll deliver an arrangement or houseplant monthly or bi-monthly to the person of your choice. How lovely to always have a source of cheer and beauty in your home! Your loved one will be reminded of your kindness with each delivery. The shop is packed with quality goods this holiday season and we’re always happy to help you pick out the perfect gift for whoever you’re shopping for - just ask! Sale, Testimonials & Wreath Workshop! SALE: We are having our first ever all store sale where everything is 20% off today (October 18th) and tomorrow (October 19th). There are so many special things in the store right now from the most gorgeous linen napkins to beautiful cookbooks, robes, pottery, plants, and children’s items. There is something for everyone! We hope you come in - we’d love to see you! TESTIMONIALS! We just added a collection of heartfelt wedding testimonials to our website. Click here to see what brides, grooms, and other family members have to say about working with us. 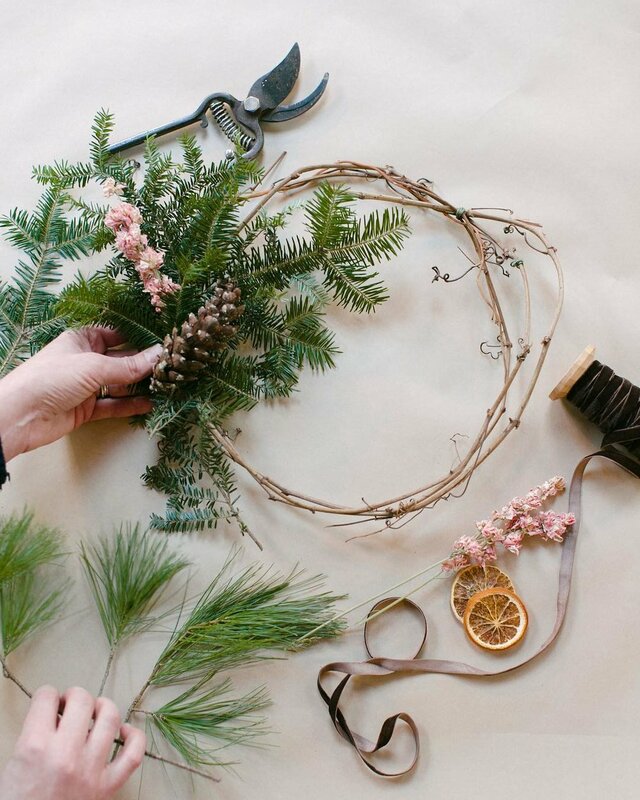 WREATH WORKSHOP: We are happy to say that it is workshop season again! Please join us on Saturday November 10th from 2:00 - 3:30 in the greenhouse for a fall wreath making workshop. We will help you build your own unique autumnal wreath using fun natural materials. You must RSVP for the event (so we know how many supplies to have!) 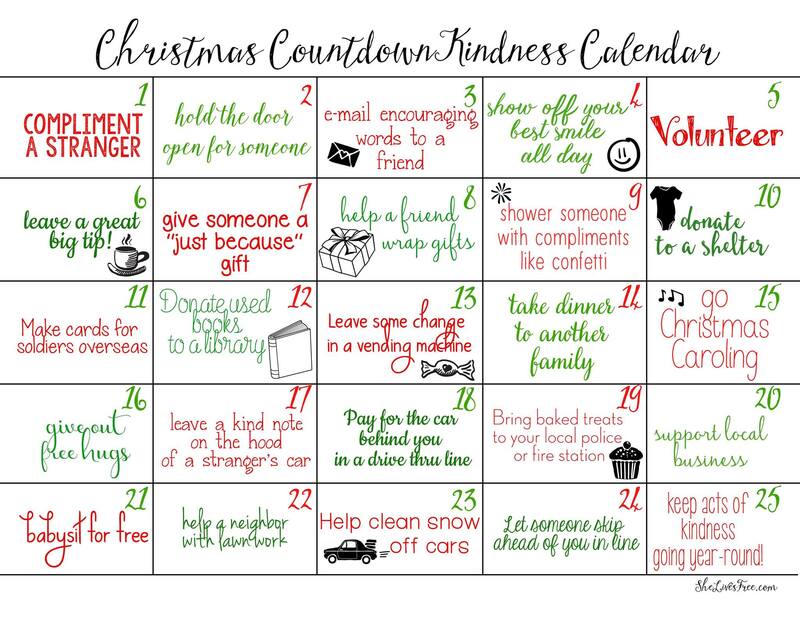 so please give the shop a call at 508-693-0392 to sign up. It is $45 per person. Caitlin & Elizabeth Shop Brimfield! 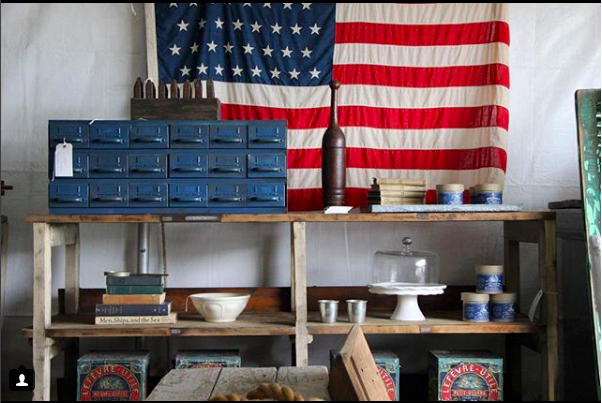 If you live in New England we’re willing to bet you’ve heard of or shopped at the famous Brimfield Antiques Show. Brimfield, as it’s called, is the largest outdoor antiques show in New England and happens three times a year - May, July, and September - and has been running since 1959. All that said - Brimfield is intimidating, especially for first timers. Among a sea of more than 200,000 visitors sit 6,000 dealers selling antique furniture, clothes, rugs, maps, lamps, art, and more. You will find midcentury furniture, mannequin legs, old doorknobs, leather jackets, and a million other unique (and odd!) things. Last weekend our power couple of Caitlin and Elizabeth ventured off island to Brimfield with an empty truck. Here are Caitlin and Elizabeth’s insider tips for shopping the grand antique market. Make sure to read all the way to the end to find out what they actually came home with (spoiler alert - the greenhouse has a new Brimfield piece as well!). -Eat a large meal beforehand (they especially recommend the cinnamon swirl pancake from Breakfast at Stephanie’s) and pack plenty of water to stay hydrated. -Bring a big car or truck to haul your goods home. Even if you don’t expect to purchase a large piece, it’s better to have an appropriate vehicle then to faced with your dream dining table and no way to get it home! -Know what you’re after. Arrive with a clear budget, list, and pictures of your space. -Measure the dimensions of your space and bring a measuring tape. It’s important to know the exact dimensions of a space you are trying to fill and while many vendors will lend our measuring tapes it’s best to have your own to quickly measure items and make comparisons. -The girls found the best deals on the last day as the sellers are more flexible. 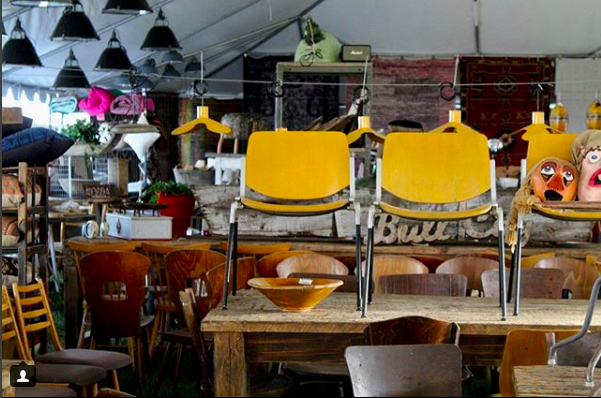 -If you’re going for just one day, don’t plan to do anything else on your Brimfield day. It is ideal to experience Brimfield over two days. -When you do pass on something but are considering coming back to it, snap a photo of the item so you can keep a visual list to return to. -Go with a friend who likes to walk and shop as much as you do and who will help you make tough decisions. -Most booths take cards now but the really old school bargain booths are cash only. -Wear comfortable walking shoes and watch the forecast closely as you may need sunscreen, raincoats, hats, or light sweaters. -An old Kentucky general store desk to use as an art desk or kitchen workbench. -Vintage and reasonably priced floral dresses, a polkadot jumpsuit, shirt, and wool sweater. -Beautiful botanical print of farm eggs. - Three vintage dresses including her wedding rehearsal dress that is handmade and fits perfectly. -The perfect enamel top kitchen table. Together they picked out a beautiful new greenhouse table that was an old cheese curd vat from Vermont. Don’t you love it?! If you have a house on Martha's Vineyard we're willing to bet you're hosting friends or family sometime over the next two weeks. This is the time of year that everyone wants to visit the island and we don't blame them - the fair, fireworks, hot afternoons splashing in the ocean - you can't beat it. The thing is, houseguests sometimes bring stress (and not just the laundry kind). We all want a clean and cheerful home for guests to enjoy and with a few little floral touches you can make your home feel extra special, without breaking the bank. So, how do you do it? We suggest calling the shop and requesting 4 small bottle arrangements at $25 each to place around the house. Maybe you place one in the guest bathroom, on a bedside table, out on the back porch, and on the kitchen island. Another idea is placing local lavender bundles in key locations. They are the most fragrant and elegant treats for bathrooms, top drawers, and outdoor shower ledges. If you'd rather go big, spending $100 on a single arrangement to surprise your guest in their bedroom is sure to make an extra special impact. Nothing beats falling asleep to the smell of roses after a long day at the beach but we're warning you, with that kind of treatment, your guests are sure to come back again next summer...and again the summer after that. 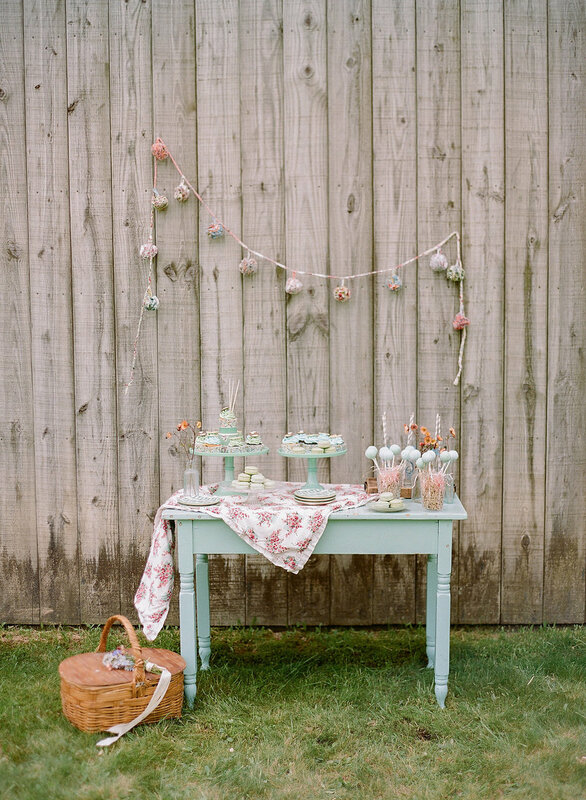 A few weeks ago Emily teamed up with island photographer Jocelyn Filley to create the most adorable girls garden party at Arrowhead Farm. Are you ready for a huge dose of cuteness?! This is a photo heavy post but it was almost impossible to pick our favorite shots. Emily makes styling photoshoots look easy when it is really a hard job. Styling jobs like this are fun ways to collaborate with likeminded creative women and find new inspiration. It doesn't hurt that pretty horses and delicious cakes were included in this one! 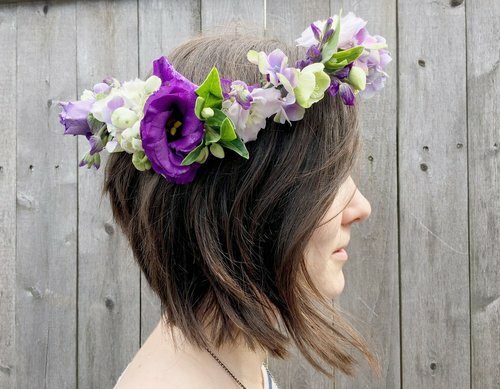 We made the sweet flower crowns from a variety of small blooms including wax flower, bachelor button, geum, and delphinium. Emily made a simple but special Pin the Bee on the Flower game. You can easily recreate this game for your garden party. All you need is a chalkboard, chalk, masking tape, packing tape, and paint. Start by sketching flowers of your choice on the chalkboard. Next, make a simple bee body out of masking tape and paint it black and yellow. Cut little wings out of packing tape and stick them on to the body. You'll want to layer 2 pieces of packing tape together to make the wings so they don't have a sticky underside. Add another little piece of masking tape to the bee body so it can be pinned directly to the flowers. Cover the kids' eyes with a blindfold, spin 'em around, and let them try to connect the bee to a bloom. Arn't those floral gift bags filled with flower confetti (aka dried petals) just the best?! Such a simple and fun party surprise. 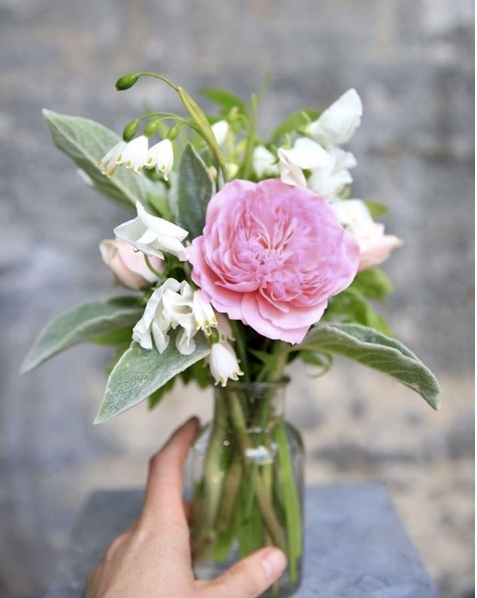 The next time you need styling help to best highlight your product, service, or skill please reach out to us at emily@morriceflorist.com We'd love to help! Today marks the first official day of summer and thus the busy season begins here on Martha's Vineyard. Every weekend from now until the end of October, festive white tents dot fields and lawns across the island, waiting to be filled with weddings guests. Brides and grooms are everywhere! 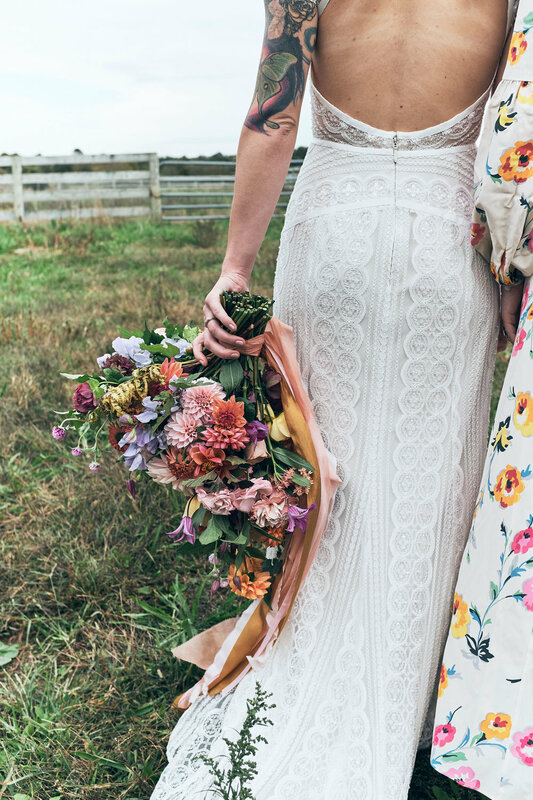 Each and every wedding day is special whether you get married in your backyard, in front of 300 guests, out on a farm, or in the sand but before all of these details are chosen, the first thing to consider is "What season shall we pick?!" The season of your wedding dictates a lot from the color palate to the flowers available and desirable locations. Today we are showing off some of our favorite SUMMER wedding moments that we had the pleasure of working on while reminding you why getting married in the summertime is so special. Warm weather means more clothing options. Summer wedding attire can naturally include light, flowing fabrics, bright colors, seersucker, and fun patterns. You don't have to worry about layering for an unexpected cool day or having to avoid cute strappy shoes. Summer nights are long and it often stays light past 8 pm. This means there is no rush on the ceremony and photography can be relaxed while there is still sunlight. You may even catch a beautiful sunset or peachy sky from your location. Fresh produce like tomatoes, corn, blueberries, peaches, and raspberries are growing and can be worked into the reception food or the wedding cake - yummy! Summer dining options like clambakes, local BBQ spreads, and pies are really fun options that take advantage of the season. If you like color, summer is a season where almost any color scheme works. You can get away with bright flowers, linens, and funky decor pieces. Pink, orange, yellow, and purple flower options are all available this time of year! If you want your guests to stay and play lawn games, gather around a bonfire, or dance under the night sky with sparklers, summer is your season. Summer days are magical but summer nights are even better. 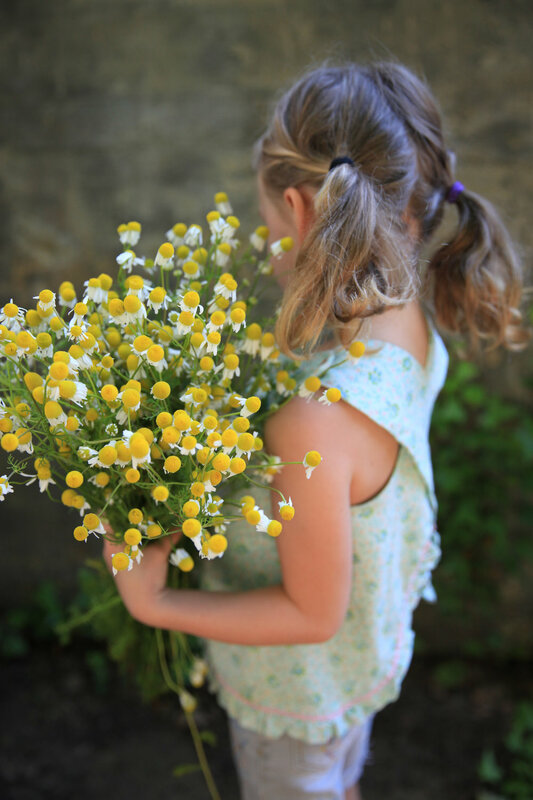 Summer flower options are special - Hydrangea, Sunflowers, Dahlias, Cosmos, Snapdragons, Feverfew, and Queen Anne's lace are just some of the magical flowers blooming. If you are a gardener, you will especially appreciate summer's amazing array of flowers. Congratulations to all of our summer couples! We love making your hot and sunny flower dreams come true. The last day of school for most island kids is next Friday the 22nd which means it's teacher gift season. We all want to present our beloved and hardworking teachers with a token of appreciation at the end of the school year but even a small number of simple gifts add up fast so it's important to choose wisely. Today we're sharing some of our favorite teacher gifts all of which are affordable and available at Morrice Florist. Of course, a handwritten note or little drawing from your student is the cherry on top of any gift. Above: Our crystals offer power, energy, clarity, and calm - starting at just $2. Pretty and useful seed packets for $2.75. Classic milky white pottery starting at $15.95. Present the market baskets filled with Morning Glory Farm strawberries, pop a perfect peony into the milk bottle, or fill the mason jar with caramels. Fill a small, textured pot with a cheery houseplant or useful kitchen herb. These cute pots are just $5.95. If a favorite teacher is retiring, present them with a classic to read on the beach - the perfect transition between school and summer. $23. Hand crafted soaps from New York in scents like Coffee-Mint and Saltwater - the perfect outdoor shower accessory. $19.95. We now have Morrice canvas totes! Everyone can use a sturdy and cute tote in their life, especially teachers who do a lot of lugging. $12.95. A Forget Me Knot flower garden kit is a lovely token when a student graduates and moves on. Anyone can become a gardener with these foolproof kits. $13.95. Island made goat milk soaps from Flat Point Farm come wrapped in beautiful paper and offer unique scents like Rosemary Lavender Golden Flax and Neroli & Tangerine Sea Buckthorn. $12.95. We have many more options in the shop - come on in and we will help you pick out the perfect gift for the dedicated teachers in your life. Three cheers for summer vacation! Each and every wedding day is special whether you get married alone on a beach, in front of 250 guests, out on a farm, or under a big white tent. Before all of these details are chosen, the first thing to consider is "What season shall we pick?!" The season of your wedding dictates a lot from the color palate to the flowers available and natural locations. 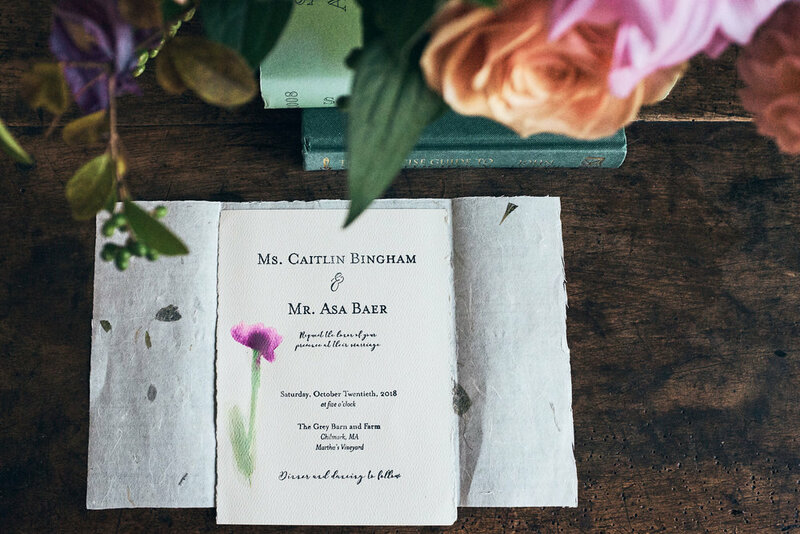 Today we are showing off some of our favorite SPRING weddings that we had the pleasure of working on while reminding you why getting married in the springtime is so special. If you gravitate towards pastel colors or like a neutral palate, then spring is right for you. 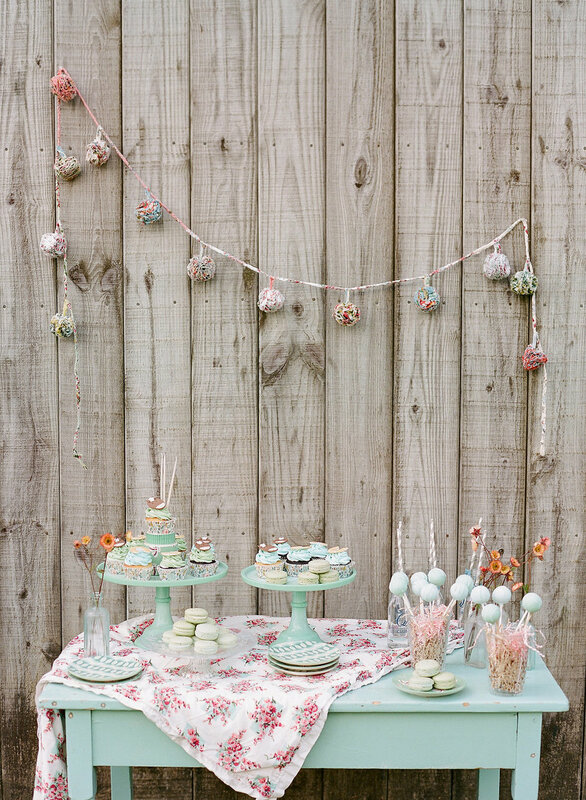 Color inspiration is everywhere and there is nothing sweeter than robin's egg blue and apple blossom pink. It's a romantic time of year with flowering trees, fallen petals, and lush gardens. Compared to high summer months, spring calendars are typically more open for guests' schedules. Lodging and travel are also less crowded and hectic in the springtime. Fresh produce like asparagus, peas, new potatoes, rhubarb, and strawberries are growing and can be worked into the reception food or the wedding cake - yummy! It is green! If you're getting married outdoors it's lovely to have a lush, green backdrop. Spring is the season of new beginnings and rebirth - a perfect time to start a new life together. Cloudy, misty spring days make perfect wedding photos. Nobody will be squinting or uncomfortable in bright overhead sun. Congratulations to all of our spring couples! 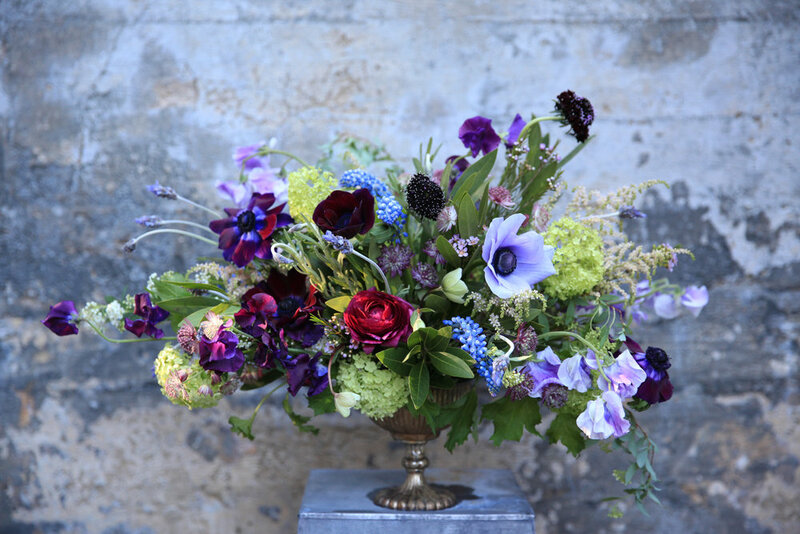 We love making your warm weather flower dreams come true. I love when customers call and request a "go for it" (meaning big!) flower crown. Although flower crowns aren't my forte to make the sentiment behind an elaborate and beautiful crown is my favorite. Either someone is buying one for themselves so they can feel beautiful and appreciated or buying one for a friend to make them feel beautiful and appreciated - I love that! A deck of Tarot Cards because everyone needs some good mystical perspective. The rush of September wedding season is always the most memorable. I vividly remember driving home from the shop at 2:30am after making arrangements all night for three or four weddings the next day. That late night drive home was so calm and peaceful - just me, the deer, skunks, and rabbits. The next morning we hit the ground running and everything was a success. I'd love to design and build an arbor for an elaborate and super beautiful flower installation where we could use water buckets instead of foam. I'd love to be able to use that over and over again! There are so many little things to keep track of because we offer such a wide range of services and so much goes into each offering. 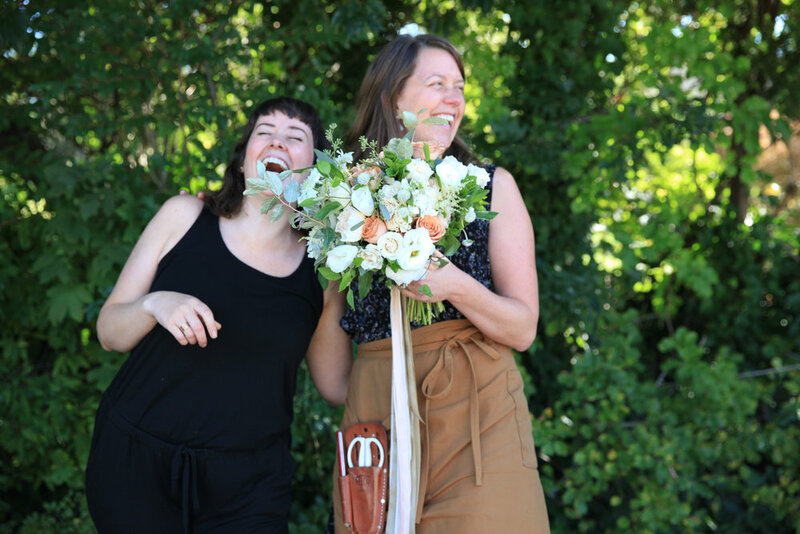 We need to juggle weddings with advertising, planting our garden, having boutonniere supplies on hand, keeping the floor clean, folding blankets on the retail floor, making arrangements on the fly, answering the phone...you get it! I'm told my arrangements wave at people - meaning there is typically a lone bloom sticking out of the side saying "hello!" (example below). I gravitate towards pinks and peaches and I really love orange. I've always grown herbs like mint, rosemary, and lavender at home and now I'm happily in a house where I can plant some flowers! I'm starting with peach nasturtiums (I love their foliage) and hellebore (they are my #1 favorite). Thank you Elizabeth! Have a question you're dying to ask a Morrice flower girl? Comment below and we'll make sure your question is included in the next Meet the Flower Girls interview. Easter is just two days away and the shop is stocked with new spring items to help your Easter bunny out! Everything here from beautiful basket grass to floral printed pencils and adorable finger puppets was chosen with care. If your bunny is stumped, here are some specific suggestions for special ways to fill a child's, teen's, or adult's basket with unique goodies. As always, we have buckets of happy spring flowers that anyone would love to receive for their holiday table. All of these things are in the shop! We are open Friday the 30th until 5:00 and Saturday the 31st from 10:00 til' 4:00. Special Seed Packets (edible flowers, herbs, bee feed mix): Beautifully packaged seed packets to plant watch grow. Pollinator Push-Pops: Push the push-pop and scatter custom seed blends to grow a garden that attracts exciting pollinators like bees, hummingbirds and butterflies. Felt Flowers: A stem or two of whimsical felt flowers add surprise to a basket. Finger Puppets: The ideal basket stuffer - cute, small, and special. We have unicorn, rocket, and mermaid characters. Zipper Purses: Special rainbow and sprinkle bags ideal to hide jelly beans inside! Floral Printed Pencils: A practical and beautiful gift. Easter Cards: Beautiful stationary to accompany a bouquet of tulips. Crystals: Add power and energy to an Easter basket! We have a huge selection of stones and crystals - choose Pyrite, a powerful, grounding and protective stone, an Amethyst to enhance intuition and create a sense of calm and balance, or Lemurian Quartz to assist in removing all types of energy blockages. Rifle Paper Co. Pins: The world's cutest pins for jackets, backpacks, and totes. Specialty Chocolate Bars: Pick from bars spiked with Pistachios, Cranberries & Sea Salt, Candied Ginger, Candied Orange Peel & Coriander, or French Vanilla, Salted Almonds & Olive Oil Ganache. Flower Confetti: We heard some Easter Bunnies leave a trail of flower confetti leading you to the goodies! Dried flower petals also make a special nest for eggs. Basket Grass: Don't buy the plastic stuff! We have neutral colored natural Easter grass for just $5 a bag. The grass is made from light wood shavings and is very lovely! It can be packed up to be used again next year. We've all been there - picked up the phone or walked into the florist, ordered a beautiful bouquet of flowers and suddenly feel like a deer in headlights when faced with penning a special card message. And we get it - love, loss, celebration - it's all personal and hard to put into words. But...words are important and a sweet, simple, unique card message can really make a difference. Pick a lyric from a favorite song: It's no mystery why tunes like You Are the Sunshine of My Life (Stevie Wonder) and You Make Loving Fun (Fleetwood Mac) are timeless hits. Get specific with what you love about them: Their laugh, ugly slippers, sense of adventure? If you have a cute pet name for each other, this is the time to use it. Poetry: When in doubt, whip out a short and sweet poem. Memory: Mention a special memory in a simple and straight forward way like "Thinking of us at the lake last summer...can't wait to do it again." Humor: Crack a joke. Everyone loves a joke. Just say it: Penning the classic "I love you" is always perfect. Appreciation/Memory: Share a specific trait you loved or memory about the person who has passed. An offer to help: "Dropping dinner off Tuesday night and thinking of you until then." Valentine's Day immediately brings to mind red roses, heart shaped boxes of chocolates, and fancy bottles of perfume but what if you want to buy a less flashy gift for your husband or boyfriend? Can you still celebrate the day of love with a thoughtful, yet manly, gift? The answer is yes! Believe it or not, there are a variety of romantic yet masculine Valentine's Day gifts in the shop. Below are our picks for our favorite guys. 1. House Plants: Whether destined for his desk or bedside table, everyone could use some greenery in the cold winter months. 2. Orchid: Easy to care for yet impressive to admire, orchids are romantic without being overly feminine. 3. Manly Soap: Everyone can appreciate a nice smelling soap bar for the shower. Pick from unique scents like Saltwater, Coffee Mint, and Man Bar (a cedar and sandalwood blend). 4. Sweets: When in doubt, go for the sweet tooth. Pick from gourmet hot cocoa mix, sea salt caramels, or specialty chocolate bars. No need to wrap, the packaging alone is a piece of art. 5. Booze Infusers: Bring home an "infuse your booze" kit and whip up two specialty drinks on Valentine's Day night. 6. Sourdough - Recipes for rustic fermented breads, sweets, savories, and more: A beautiful cookbook is not only a thoughtful gift for a home baker but may also inspire you to cook together more. 7. Massage: There is nothing that says "I love you" quite as much as the gift of self care. Sonya Mayrand massage gift certificates are available at the shop for 60 minute ($110), 75 minute ($130), and 90 minute ($150) sessions.